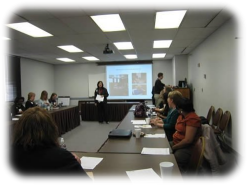 The IPMA-HR Greater KC Chapter is a non-profit organization comprised of human resource professionals from area cities, counties, state, federal and non-profit organizations throughout the Kansas City metropolitan area. Our membership meets on the 2nd Thursday of each month from July to March. In April the chapter hosts our annual Spring Conference which is a full day of activities and training events for the HR professional in today’s business world. For details of this year’s meeting topics and schedule check out the Calendar and then be sure to complete your Event Registration. We look forward to seeing you at the next IPMA Greater KC Chapter event! IPMA-HR GKC is a not-for profit professional organization for persons engaged in public sector human resources. We rely on membership dues and sponsorships to keep our learning and networking activities affordable for our members. By partnering with IPMA-HR GKC, your organization can reach over 100 public sector human resources professionals throughout the metropolitan area. More information about our sponsorship packages can be found here. Learn how you can become a member of the IPMA-HR Kansas City chapter and share in the opportunities our members enjoy. For the third year, the IPMA-HR Central Region and Southern Region will combine forces to present one amazing training conference. This year's conference will be in Charlotte, NC, April 13 – 16, 2014. With 20 breakout sessions to choose from and four general sessions, plus the opportunity to obtain IPMA-HR certification, there is something for everyone on the program. The incredibly low registration rate includes 2 ½ days of training, most meals and several social events! Check out the 2014 Region Conference website and register today! We are happy to share your job opportunities with our IPMA-HR Greater KC Chapter members and website vistors. Each job posting is $50 for chapter members and $75 for non-members. The posting will be online within 48 hours of receipt and remain online for a period of 30 days, less if requested. IPMA-HR Greater KC Chapter is an affiliate of the International Public Management Association for Human Resources (IPMA-HR), a nonprofit and educational organization, committed to the advancement of the public sector by providing HR professionals with key educational and training opportunities, valuable resources and assessments products, and effective advocacy at every level of government. IPMA-HR represents more than 9,000 individuals and 1,100 agencies at the local, state and federal levels of government worldwide. IPMA-HR is comprised of four U.S. regions and more than 42 affiliate chapters that operate independently and provide members with professional resources and events and career advancement opportunities.